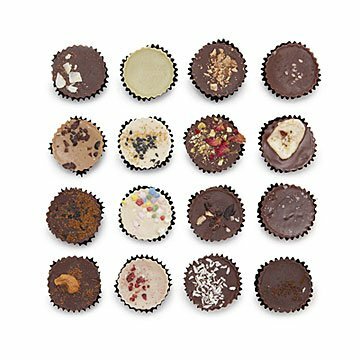 Lotta Andonian’s 16 luxurious variations on the chocolate and nut butter cup theme are confection heaven. The day peanut butter and chocolate became BFFs, human life went from a scramble for survival to a sweet sojourn. When Brooklyn-based Lotta Andonian applied her creative talents to this flavor pair, a new era of confectionary heaven began. Not only are there 16 generously sized nut butter cups in her luscious, hand-crafted assortment, but each one is totally different from the next. From birthday cake to matcha cashew to pink chocolate cherry-chai almond butter, every piece is sensational and sophisticated. Lotta uses the highest quality, sustainably produced ingredients—including organic, vegan chocolate made in Brooklyn—to create luxurious, small-batch treats that are worth the indulgence. (We know: our entire sample box disappeared in minutes, followed by silence as team members entered states of rapture). Handmade in Brooklyn. Lotta Andonian started selling handmade, organic peanut butter cups as a side project to her London fashion marketing work. Orders increased quickly, and the following year, she quit her day job to make chocolates full-time. Within months, Lotta's chocolates were stocked in some of London’s most prestigious food halls. Despite her success, Lotta grew homesick, and moved to back to the US, where she relaunched her confectionery business in Brooklyn. She is committed to hand-crafting delicious and ethically produced confections, in dozens of flavors, that cater to numerous dietary restrictions while delivering exquisite taste. Store in a cool, dry place between 60-68 degrees. Chocolates can also be stored in a refrigerator if kept in a sealed, airtight container.